Spandau, Spandau is barrio or district in Berlin, northeastern Germany, situated around the confluence of the Havel and Spree rivers. It is industrial. After World War II, it was part of the British Occupation Zone in West Berlin and the Spandau Prison, built in 1876, was used to house Nazi war criminals who were sentenced to imprisonment at the Nuremberg Trials. 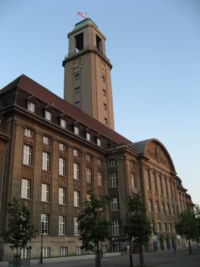 After the death of Rudolf Hess, the prison's last inmate, Spandau Prison was completely destroyed by the allied powers. According to Albert Speer in his Spandau: The Secret Diaries, Hitler expressed admiration for Adenauer, noting his building of a road circling the city as a bypass, and of a "green belt" of parks. My name is Luis Regueira, librarian of the Canary Islands Museum (El Museo Canario) in Spain. Our institution is preparing the publication of a book of memories by Ms. Emmi Hahnefeld, who lived in Berlin during the Second World War and was displaced in several camps, such as Spandau, Mühlheim and Mittenwald. It's being quite difficult to obtain photographs of these displaced camps in order to illustrate this part of the book, so I would like to ask you for some help. Please tell my if you know where could I get these pictures or who could have them. We would be very grateful for any help. Thank you very much and please forgive my scarce control of your language. A postwar community of displaced persons is recalled with several mass burials, and about a dozen tombstones. Source: Steinerne Zeugnisse jüdischen Lebens in Bayern; eine Dokumentation, 2nd ed. by Israel Schwierz. München: Bayerische Landes- zentrale für politische Bildungsarbeit 1992, ISBN 3-87052-398-0, 368 pp. [1st ed. 1988, ISBN 3-87052-393-X, 352 pp.]. I was in a DP camp in Strut by Ansbach in Bayern (Bavaria), Germany, from February 1946 until February 1947. This camp housed only children belonging to Dror habonim and the Shomer hazair, Zionist organizations. I have been living in Israel since 1947. Tried to find pictures or any written evidence of the above mentiond camp, but in vain. Can you please help me to find the site, if any, showing any pictures or telling something about this camp. Thank you in advance, Update: I found the place. It is the Rangau klinik, Strut 24. About 4 Km. 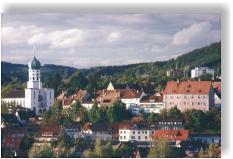 distance from Ansbach the town. At the time in 1946-1947 this UNRRA camp housed about 300 children and the UNRRA staff. Somehow it disappeared from all the documentation of the DP camps, in Bayern, Germany. I regret to say, but I have no picture or any written document I can send you. I shall try to send you some picture of the camp, I found in the commercial advertisement of the klinik. Thank you for answering me, so quickly and for opening a new site, of the DP Camp of children in the sanatorium "Strut by Ansbach"
30,000 forced laborers were used in Stuttgart in factories, as well as agricultural and housekeeping services. As a favour to a retired Polish - born female correspondent in Ontario, I seek information about Karol Wolf, a Roman Catholic born Jaroslaw, Poland, 1897, who was, in 1943 (? ), deported from Pultusk to KL Stutthof. Karol perished somewhere within the Stutthof camps' complex. Before his deportation, he was last seen by a sister, in an extremely emaciated state, in a Pultusk prison. Karol, a one-time fellow journalist, spoke 9 languages and was employed in the Nazi-overseen Pultusk civil administration as an interpreter and translator. He may have been connected to the local Polish Resistance ? A week before his arrest and imprisonment ( for what reason, by whom and detained where? ), Karol - Karl was warned to escape. He seems, wrongly so, to have felt safe. Arrested and interrogated, he must have been held in the Pultusk prison for some weeks to have been so disoriented and so emaciated when his sister last saw him. Someone, somewhere, in the Feldpolizei, the Gestapo-SD, SS, Abwehr local and regional hierarchies must have authorised Karol's arrest, monitored his detention and authorised his deportation to Stutthof. We do not know when or in which transport he was taken to Stutthof. There are no known records at Stutthof which might educate us about these scenarios. I have been contacted by another family whose relative was sent to Stuthof. Gave them some ideas about follow-up activity. No reply yet. Sent a second message saying that I am here if needed and am willing, she agrees, to link them to Rita Robinson in Ontario; suggested that they set up a new Internet - based Stuthof Study Group...that they tap into the existing structures, unite with other families of Polish origins, etc...wait and see. Rita is all for latter idea. She rang me for the first time and we had a richt auld tooranally! I found the relocated grave of Rita's father, Tadeusz Wolf, in Perth, Scotland; he died in Selkirk. Tadeusz, an Anders Army veteran who was with the post-war Polish Resettlement Corps, died in 1947, aged only 27. He now lies in a grave at the Polish War Cemetery outside Perth. A special grant allowed the creation of the cemetery, a website and the compilation of an on-line Graves Register. There is also a beautiful memorial. As you know, I am trying to find info about the pre-Stuthof life and post-deportation life and fate in Stuthof / a sub-camp of Rita's grandfather, Karol Wolf. I was amazed to find such a vast website about slave labour and displaced persons in WW2. A few years ago I received my father's dairy he kept during the time he was in Germany. In November 1944 about 50,000 men from Rotterdam (The Netherlands) were taken to Germany. My father was one of them. He was put to work at the Reichsbahn (railway). He had to repair bombed railway lines. The camp my father stayed in was not very strict, he almost could go as he pleased, but the food situation was very poor. In March 1945 he was liberated by American paratroopers. It was not until June 1945 that he was able to return home to Rotterdam and to the woman that would later become my mother. This is very, very short the story. About a year ago I visited the surroundings in which the camp was were my father lived during his stay in Germany. The camp was in Sythen, a small village, close to Haltern just north of the Ruhr area. By talking to some elderly men I found out about a camp in which Italians lived who worked on farms, but nothing about Dutchmen that worked on the railroad. The internet doesn't give me any information about where the camp might have been. I have also been in touch with some German authority in Haltern. He could tell me about a camp and about Dutchmen in Haltern, but about Sythen, he didn't know anything. I really like to visit the spot where the camp was. Perhaps you can help me. Thank you very much in advance, marja.levien@planet.nl The Netherlands.